Unspoiled and classic, Cedar Beach Cottage, has been hosting vacation guests for 120 years. Tucked off the beaten path, this private turn-of-the-century former Inn features 6 bedrooms and 4 updated baths, making it the perfect vacation home for family reunions and larger groups. Guests will also enjoy expansive, open lawns, a spacious, south facing porch, and a deeded walking R.O.W. to Bailey Island's desirable Cedar Beach. 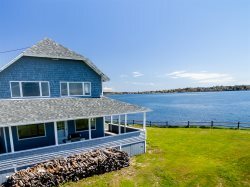 Cedar Beach Cottage is benefitted by an attached 2 bedroom, 1 bathroom apartment that can be rented in addition to the main house and would otherwise be vacant. For more information, please contact MaineStay Vacations. My family had a fabulous time at Cedar Beach Cottage. The many bedrooms gave everyone the privacy and quiet place they needed while the large living, dining and kitchen area accommodated our large party beautifully. We greatly enjoyed the beach area and especially the large lawn where many games of croquet were played. We will definitely like to come back some day.